DC comic book fans will absolutely enjoy this rendition of The Death of Superman since it is well animated and sticks closely to the original source material. In 1992, DC Comics decided to create a crossover story that saw the Justice League battle Doomsday. However, unlike most of the DC comics, this story didn't end so well for our superhero friends and, shockingly, ended with Superman's demise. While some of the media felt it was nothing more than a publicity stunt, it created a three-part series including some of the bestselling and most well-received comic books in the history of DC comics. Since then, his death has been depicted in film, most recently in 2016's Batman v Superman, but now DC Universe Movies along with Warner Bros Animation is offering their version in July's The Death of Superman. As the film begins, we see the Justice League, led by Superman (Jerry O'Connell; Stand By Me), foil a plan by Intergang to kidnap the mayor. They were armed with Apokolips technology, which the Justice League sends to the lab for analysis. Meanwhile, Superman's Alter Ego, Clark Kent, is in a relationship with Lois Lane (Rebecca Romijn; X-Men) who feels he holds her at arm's length. As a compromise, Clark has Lois meet his parents when they come to town and at the same time, Superman gives Lois an "exclusive" - a look at the ship that brought him to earth. Suddenly, a monster (Doomsday) hurdles to Earth and starts destroying everything and everyone in his path. The Justice League comes together to try and stop Doomsday, but all efforts are in vain as he takes them down one at a time. During a quiet lunch, Clark tells Lois his true identity only to be called away to help stop Doomsday. Lois and Jimmy Olsen show up on the scene just in time to witness Doomsday all but destroy Superman, who manages to kill Doomsday as the same time. As Superman/Clark lays dying, Lois runs to him, where he dies in her arms - or that is what we are led to believe. The ending leaves that in doubt, making way for next year's Reign of the Supermen. O'Connell portrays Superman with an array of tonal inflections and a depth that makes his demise sting that much more. He gives us an all too human side of the alien being and continues a long tradition set by his predecessors. Romijn is fine as his love and hardnosed reporter Lane but lacks a certain emotional depth that would make the audience feel sympathetic towards her. The supporting cast offers a litany of well-known names including Rosario Dawson (Luke Cage) as Wonder Woman, Rainn Wilson (The Office) as Lex Luther, Jason O'Mara (Agents of S.H.I.E.L.D.) reprising his role as Batman and the distinctive tonal quality of Nathan Fillion (Castle) as Green Lantern. The field of animation has grown leaps and bounds as technology has evolved and The Death of Superman truly benefits from this as characters are "drawn" with depth and shadowing. The 1080p video showcases these tones nicely. Coupled with the DTS-HD Master Audio 5.1 the viewing experience is well worth it and enjoyable. The Deluxe Edition comes with a Blu-Ray disc, DVD disc, Digital HD, and a collectible Superman figurine. The combo pack has some nice extras including From the DC Comics Vault: Legion of Superheroes and Dark Victory: Part 1 and Part 2, as well as one featurette and a preview of the Reign of Supermen. 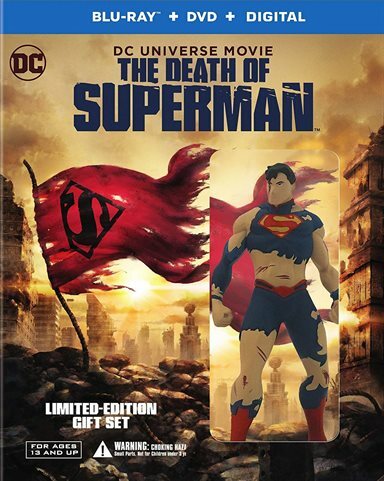 DC comic book fans will absolutely enjoy this rendition of The Death of Superman since it is well animated and sticks closely to the original source material. The script leaves a little to be desired at times with some cheesy one-liners; however, they aren't so bad as to be distracting. If you are a DC Superman fan, I recommend splurging for the Deluxe Edition as it will offer what you are looking for, including the figurine. Download The Death of Superman from the iTunes Store in Digial HD. For more information about The Death of Superman visit the FlickDirect Movie Database.